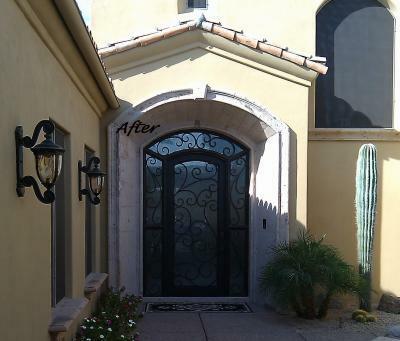 Pictured above you will see a recent install of an iron entry door with a transom and sidelights. This door is perfectly framed by the exterior molding and looks as though this door should have always been the entry way to this home. This iron entry door not only transforms this home but also alows for more natural light to enter the foyer, brightening the inside of this home as well. To put the finishing touch on this home we can replace the two existing windows nearby and add matching iron scroll work or custom ornamental iron railing. 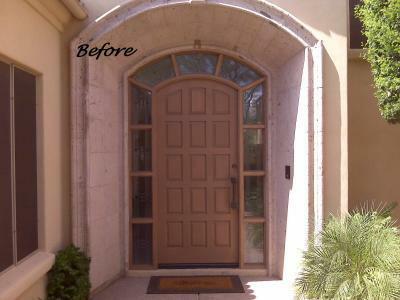 While maintaining elegance this door is durable and long lasting and sure to catch all the neighbors eyes.